Experience the joy and wonder of the holiday season every day at Christmas Town at Busch Gardens Tampa Bay. New this year, guests can enjoy millions of twinkling lights, Christmas shows and Sing-A-Long Train, and of course visits with Santa and Rudolph® – now EVERY DAY of the season – starting Nov. 17 through Dec. 31. 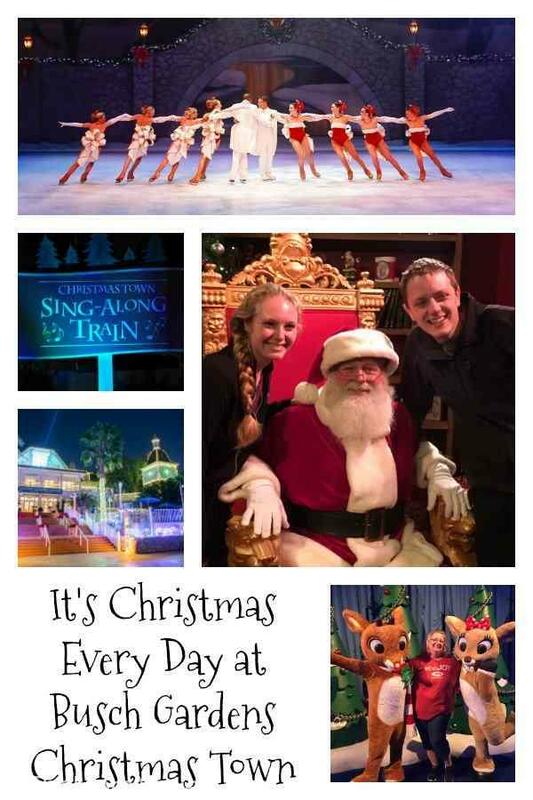 Christmas Town features extended hours on weekends and additional select dates with even more new experiences, including an all-new holiday show, indulgent culinary treats, visits to Rudolph’s® Winter Wonderland, nighttime experiences on Florida’s best thrill rides and so much more. Christmas Town is included with any daily admission or annual pass, and is open until 10 p.m. on select dates. There is so much to experience and see during Christmas Town at Busch Gardens. New this year at Dragon Fire Grill is the holiday spectacular “Christmas Is…” featuring contemporary music that celebrates seasonal traditions. The new show joins a festive line-up of returning favorite shows including Christmas on Ice, Elmo’s Christmas Wish, the Holiday Hills Band, Carol of the Bells light show and the Christmas Town Sing-A-Long Train. Come early with the whole family and make Christmas Town the unforgettable backdrop for your holiday card! Santa will be awaiting your visit at Santa’s House presented by Coca-Cola®. Additional amazing photo opportunities are around every corner: the enchanting twinkling light tunnel leading into Stanleyville, all your favorite characters at Rudolph’s® Winter Wonderland, Ice and Poinsettia princesses along pathways, larger-than-life Cookie Monster® and Elmo® nutcracker figures along the Sesame Street® Safari of Fun walkway, and playful penguins at the holiday-themed Penguin Point. Guests will discover even more merriment in the Christmas Town Village, celebrating the season in a new location. Greeted by friendly snowmen, guests will be immersed in festive fun along the Gwazi pathway, including merry merchandise and tasty holiday treats. In this enchanting realm, little ones can even take a ride on the fan-favorite Jingle Bell Express miniature train. Indulge in winter whiskey and wine tastings while completing your holiday shopping with unique gifts from artisans around the world at the Artisan Market at Xcursions and around the park. For a gift that gives all year, shoppers can select a new Busch Gardens Annual Pass with benefits to enjoy exciting events, world-class coasters, and up-close animal encounters. From Bronze, Silver, Gold and Platinum, guests can select the pass with perks they want most – all with no down payment. For a limited-time, Busch Gardens Annual Passes start as low as $9.99 per month for Florida residents. In 2019, Pass Members can look forward to unique benefits, the park’s 60th anniversary celebration and exclusive ride time for the spring opening of Tigris, Florida’s tallest launch coaster. We love visiting Christmas Town at Busch Gardens. To read about our visit last year, click here. For complete event information, including dates, times and packages, visit ChristmasTown.com.